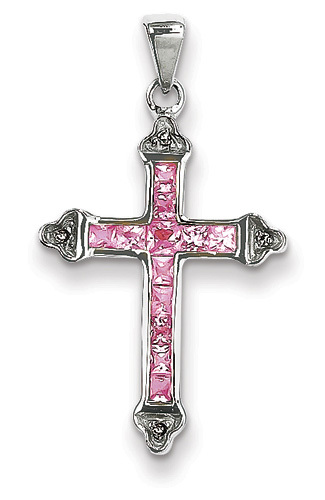 Princess-cut pink sapphire gemstones are set in a 14k white gold cross pendant with diamond accents. Cross measures approx. 7/8" tall (1 1/18" tall with hoop) x 11/16" wide. Pink sapphire gemstone weight: approx. 0.78 Carats. Diamond weight 0.01 carats. View our unique collection of pink sapphire jewelry. "And the foundations of the wall of the city were garnished with all manner of precious stones. The first foundation was jasper; the second, sapphire; the third, a chalcedony; the fourth, an emerald" (Revelation 21:19). We guarantee our Princess-Cut Pink Sapphire Cross Necklace, 14K White Gold to be high quality, authentic jewelry, as described above.